When you factor in widespread industry shortages and intense competition, sometimes the best place to way to find the talent you need is to look to those that are already employed. 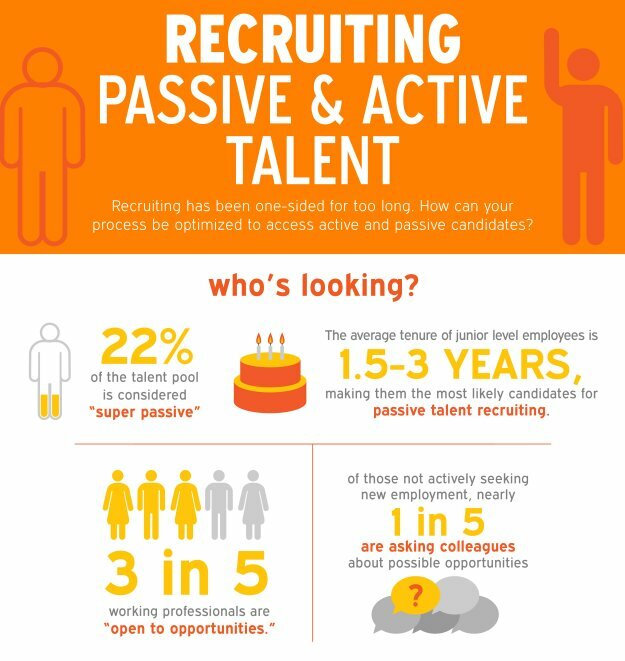 While they aren’t actively looking for a job, passive candidates can be some of the most valuable talent out there, if you know how to reach them. Otherwise, they become missed opportunities. Looking for a new hire? Click here to find Healthcare talent. Of the nearly 80 percent of candidates that are employed right now, over half of them are open to switching jobs or working somewhere else. That’s a big number that shows there are a lot of people out there that want a change, but maybe just don’t have the time to make a jump or know where to start. While they may be more difficult to source, they are still potential hires. When you ignore passive candidates, you’re essentially opting out of access to a massive pool of some of the best candidates. Passive healthcare candidates tend to be more motivated and are far less likely to need skills education or development. However, successfully accessing, attracting and engaging these candidates takes a unique approach and some different strategies that we’ll explain in this blog. The traditional methods of attracting active healthcare candidates simply aren’t as effective when it comes to passive candidates, so it’s essential that you find different ways to make them aware of your organization’s exciting opportunities. Raising brand and job opportunity awareness can be a challenge, but by utilizing inbound marketing tools like social media, blogging and email marketing, you can do it effectively at minimal cost. While a radio ad may have worked well in the past, traditional outbound recruiting methods aren’t as effective as they used to be. This is why many firms are turning towards digital and inbound marketing as a solution. When you create interesting content that shows what makes working at your company great, you grant passive candidates the ability to look inside your organization to see what it might be like to work there. In many cases, it’s the fear of the unknown that keeps passive candidates where they are. They might be worried that they’ll regret leaving their current job, but if you can clearly communicate the value of your brand and the quality of your workforce, you can push them over the edge towards making the big decision to leave their current position. Your content can be the catalyst that jump starts a passive candidate’s decision to leave their job. You can better attract passive candidates with a strong employee referral program. There are many advantages to establishing a program. According to a recently published study by JobVite, healthcare employee referrals can generate up to 40 percent of all hires. Additionally, referred candidates are hired 55 percent faster than traditional candidates. With a referral program, you can hire more top quality candidates faster, which helps your company on multiple levels, in terms of both productivity and cost. Referred candidates are often passive candidates. They may not be actively looking for a job, but when an employee communicates to a close friend that there is a good opportunity out there, they’re more likely to take advantage of it because they’re hearing about it from somewhat they trust. As you target the “active” healthcare candidates who submit resumes to your company’s website, a healthcare recruiter can target passive candidates for any role you’re looking to fill. This frees up time for you to better screen and get to know the applicants that are coming through traditional channels. Recruiters have the skills, expertise and network to not only identify passive health care candidates, but also to push them towards making a change. Recruiters have the sales mentality that is sometimes needed to convince passive candidates to work for another company. Most importantly, they will communicate your employer brand in the proper way, being sure to highlight the value of your company and the opportunities for growth that exist there. Above all, relationships are the key to recruiting healthcare passive candidates, and while they may not be the “holy grail” of recruiting, they represent an untapped pool of talent. It’s worth noting that when you go after passive candidates, there’s a higher chance of having to grapple with challenges like counter offers. It’s not an overnight solution to hiring, it takes a long time to nurture passive candidates to turn them into new hires. You could certainly leave this task to your hiring manager, but the waters of recruiting passive candidates can be tricky to navigate. 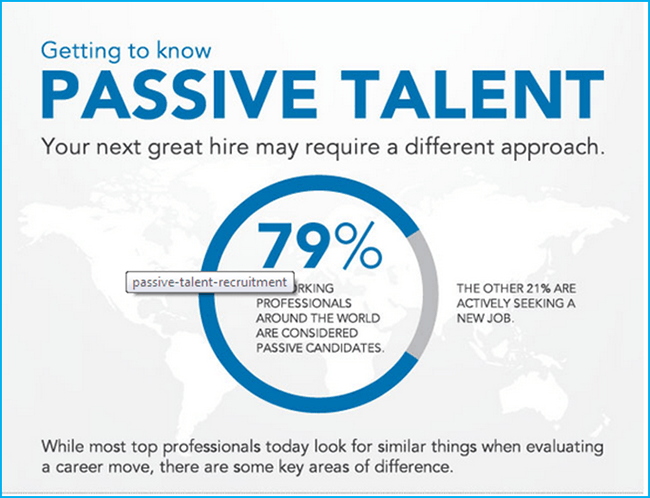 How will you identify passive candidates? And once you do, how will you be strategic in convincing them to join your team? 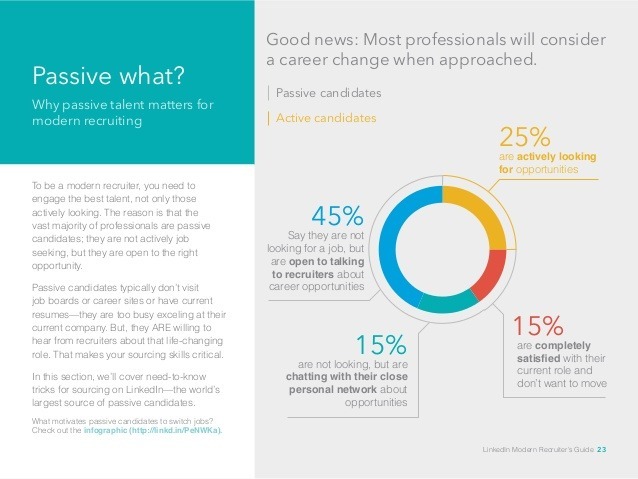 Not every company has thought this through, according to LinkedIn’s Global Recruiting Trends Survey, nearly half of all companies don’t have a strategy in place to recruit passive healthcare candidates. If you need a healthcare recruiting partner, look no further than Healthcare Recruiters International. Our experienced health care recruiters conduct searches with unmatched thoroughness to identify exceptional talent time and again. Our carefully developed process helps us evaluate candidates to the fullest extent. Our quality and timing for submitting candidates often exceed client expectations and many of our clients have been working with us for over 15 years. Our recruiters specialize in recruiting for allied health, psychiatry, and healthcare executives. Additionally, we focus on hospital, medical research and biotechnology.